when searchingthe Internet, well, you’re right. our offers are costume made for you. no one can wish you a better stay. without caring about handling money. when they are most needed. It’s a kind of magic: AR function. of your surroundings anywhere in the city. Your secret agent on your screen. generator also does this job for you. “who” knows you better than anyone else. like most of tourist apps, our offers are costume made for you. You can get the most authentic recommendations and offers by Budapest citizens. No one can give you better tips, no one can wish you a better stay. One click payment – and forget about cash and cards. Our app manages all your expenses easily and safely only with one touch. worrying about losing them, and hardly finding them when they are most needed. Our app is your secretary to handle these jobs. You shouldn’t stress yourself organizing your program. Our personalized trip generator also does this job for you. You have your own tour guide “who” knows you better than anyone else. real attractions behind the walls of your surroundings anywhere in the city. Buying tickets is easy, AR is cool as well! IWelcome2 helped us to have an awesome time in Budapest. The app made our trip easier. I loved Budapest and this app as well. It was easy to get every tickets online here. Cool app to find local stores and bars, and also top attractions are included. I bought our bus tour ticket here it went perfectly. attract a great deal of attention! Are you ready for an extraordinary challenge? 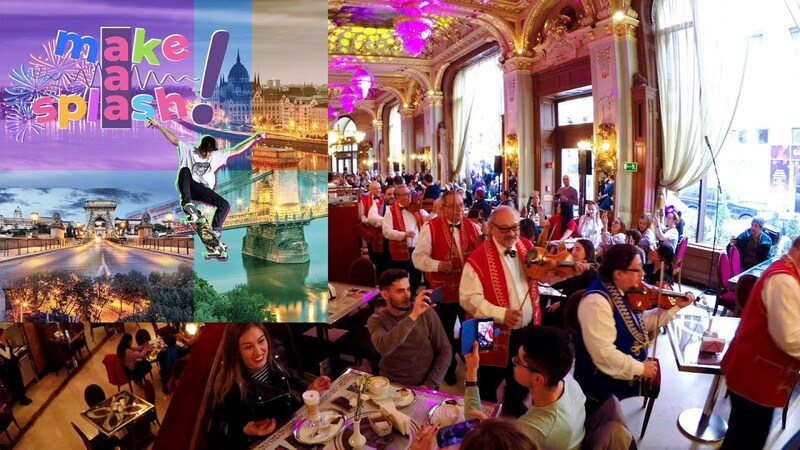 Win a trip to Budapest, and sign up for this ultimate contest! iWelcome2 invites influencers, competitors, adventurous people from all around the world. You can make a splash in Budapest with anything – anywhere. Media. Let them make a splash in Budapest! As big as possible, as noticeable and as surprising as possible. The application period opens 18th of March and ends 22th of May 2019. A little creativity goes a long way. Have fun with your application and try something unexpected. We want to see the real you. Participation in Make a splash is based on votes, one like on your post on any social media channels (facebook, instagram, twitter, youtube) means one vote, if you use more channels that’s fine, we summarize all the likes that you get, so think big. Utilise news networks, social media, friends and family connections to spread your application further. Don’t forget to add #iwelcome2 #makeasplash hashtags to all of your social media activities. Be over the age of 18 and have the courage and experience to create an outstanding video content. You can apply in pairs and lone wolfs are welcomed as well. Plus, we document the event for marketing purposes, so as a participant you approve that you can be filmed, photographed and interviewed both before and during the event. The more votes you get the bigger chance that you win the trip to Budapest or the main prize the round-the-world trip. iWelcome2 reserves the right to remove votes not linked to individually managed and personally owned Facebook accounts. Profiles on the iWelcome2 site that have frequent and numerous votes from such accounts will be removed. at the end of the season wins a round-the-world trip.